Ad-blockers are on the rise. Boy, there’s a phrase that puts cold fear into the heart of any marketer or business owner! Marketing has been in a Cold War with ad-blockers ever since the early days of the internet. Ad-blockers are browser extensions that will automatically filter out all of the advertisements on a website before it loads. The result is that the viewer will get a website completely free of any ads. Great for the viewer, but not for the businesses that are buying ads on the site. Originally, ad-blockers were used for a legitimate reason: to block spam and adware that could damage or slow down computers. Years ago, unscrupulous marketers would take the lowest methods to get customers, resulting in spammy ads on every website. And if you were unlucky enough to download malware unknowingly, it wouldn’t matter if you were on a website that had ads or not, they would still pop up. However, modern ad-blockers have evolved to block all advertisements, no matter how small or inoffensive. That’s a massive problem for websites whose only revenue is ad-based. And just as bad for the businesses that are using that site to advertise their products or services. Even worse, there are now ad-blockers out there that can filter Facebook newsfeeds, completely removing promoted posts, ads, autoplay videos, and other kinds of targeted advertising. Although these tools aren’t available on mobile, they have severely cut into the desktop marketing potential of Facebook. Ad-blockers are the bane of many marketers. But there are ways around them if you know the tricks! Content marketing has been on the rise over the last few years, and it shows no signs of slowing down. At the moment, there is no better way to connect to audiences online than actually provide them with interesting and useful content. Most of this content isn’t considered to be marketing by ad-blockers, meaning that you will be able to completely get around them by better incorporating your messaging into genuine content rather than a stand-alone ad. For example, blog posts nicely slip past ad-filters because they, well, aren’t ads! Blogs are merely content that may happen to mention the services that your small business offers. This is why having a weekly blog can be such an effective marketing method. And if you don’t have the time to write one, you can outsource the job to a virtual assistant. Now, I would never suggest that you completely ignore entire demographics, but there are groups of people who are more likely to have ad-blockers installed than others. Millennials who distrust advertising in all of its forms are usually the ones who have these programs installed in their browsers. Marketing towards this group means that you might be reaching a smaller percentage of them than you otherwise would. If your products or services are primarily targeting those who are 35 and above, you probably won’t need to deal with ad-blockers quite as much. Again, I’m not saying that you shouldn’t market to millennials (because that would be foolish). I’m just suggesting that you put your advertising dollars where they can make the biggest impact. As I said above, Facebook ad-blockers have been rapidly becoming more and more popular. Does that make Facebook a less viable advertising method? Not at all. It just means that you might want to shift your focus to mobile. The vast majority of people on mobile phones and tablets access Facebook through the official Facebook app. There is DEFINITELY no ad-blocking in there, meaning that the viewers will get the experience intended by Facebook. This includes your ads and boosted posts. Mind you, if you go this path, you are going to be advertising on smaller screens. This might require you to shift your advertising strategy a bit. You need to create Facebook ads with colors and designs that will pop on mobile screens. 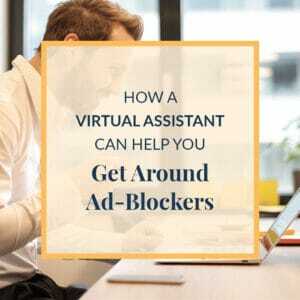 If designing ads isn’t your thing, then you can hire a virtual assistant to create them for you! You can also grab my free Workbook: How to Write Your Own Facebook Ads here. Ad-blocking is quickly becoming the norm online. Thankfully, you have a virtual assistant who knows how to get around it! Sometimes, laying on a guilt trip works! Look, there are a lot of reasons out there to block ads, and many of them are legitimate. People are defending themselves from intrusions into their browsing experience. But you know for a fact that the advertisements on your website aren’t intrusive at all. So… just ask them to whitelist your site. All ad-blockers allow users to put sites on a whitelist. This means that when they visit that one specific site, they will see the ads they are intended to see. It’s amazing just how effective asking them to whitelist your site can be. I wouldn’t recommend making it an ultimatum, don’t try to completely block them from your site and content if they don’t agree as this might completely turn them off your business. But just a simple ask may reopen many of your customers to the ads on your website. The thing about ad-blocking is that it’s not going away. Many marketers and companies are sticking their heads in the sand, hoping that one day people will suddenly decide to let ads back in their lives. That isn’t going to happen. The real way around ad-blockers is to embrace forms of advertising that aren’t intrusive. You want your marketing to be part of the content and experience, not interrupt it. Honestly, this can be a tricky mental shift to make (I know because I had to make it too!) But if you want some help figuring out how you can make your marketing more effective than ever in the age of ad-blocking, please feel free to contact me today! We can create a marketing strategy that will connect you with your customers in an entirely new way!